What is this ‘Monty’ – some kind of a race? At eight words, the title of this film is a mouthful. Combined with animated illustrations by famed British cartoonist Ronald Searle, it speaks beautifully to the chaos of director Ken Annakin’s breakneck adventure to Monte Carlo. In the 50s and 60s, as the American automobile industry pushed ever forward, race films surged through Hollywood and forced their way into the British and European landscape. Joining other race films of the day like Around the World in Eighty Days (1956), The Great Race (1965), and Those Magnificent Men in Their Flying Machines (1965), all of which feature lively illustrated title sequences, the British/French/Italian-made and American-imported Jaunty Jalopies was set in motion in madcap fashion. The opening sequence illustrated by Ronald Searle presents a zany journey of grand proportions, featuring wild country and colourful characters. It also literally turns scenes on their head, impressing upon viewers the image of the great wheel, ever turning. The slapstick comedy features some of the usual suspects of the era: Tony Curtis, Susan Hampshire, Dudley Moore, and Peter Cook. The film’s backbone is the Monte Carlo Rally, an event which began in 1911 as sport and as means of demonstrating automotive innovation. It’s a historic race in which competitors set off from far-flung corners of Europe with the intention of meeting in Monte Carlo, Monaco. Picture it: each year, a number of monied and eccentric characters from all over the world get into various, specially chosen vehicles and race across a continent toward a single meeting point. For fame and glory and automobile marketing. The original UK title, Monte Carlo or Bust!, speaks to this competition directly. However, as is often the case for American releases of films made elsewhere, the studio wanted to change the title to capitalize on audience familiarity. It was renamed to tie in with Annakin’s previous race film, 1965’s Those Magnificent Men in Their Flying Machines (for which illustrator Ronald Searle also created a memorable title sequence). 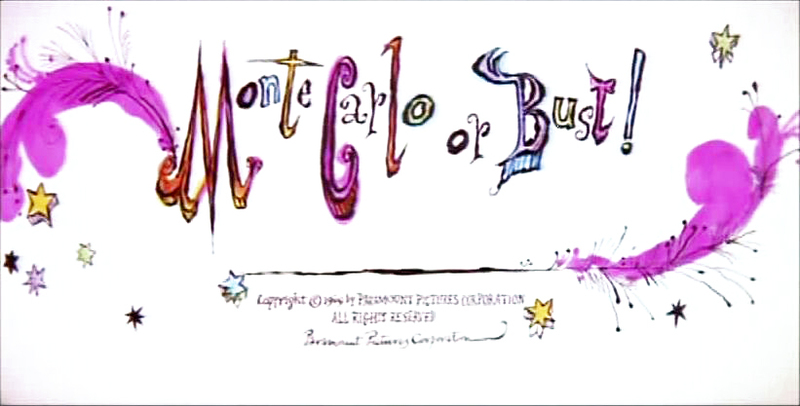 Title card featuring the original title, Monte Carlo or Bust! 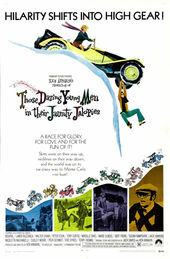 The final title decided by Paramount Pictures, Those Daring Young Men in Their Jaunty Jalopies, lengthy at eight words, is actually a misnomer on two fronts. Firstly, the film is not just about men – it features a number of female characters, some of whom are drivers in the rally with their own jalopies. Secondly, none of the men were particularly young at the time of shooting; Tony Curtis was 43, Walter Chiari was 44, Peter Cook was 41, Bourvil was 51. Regardless, Searle’s brand of loose but keenly observed sketches, created during long stints on set, prime viewers for the film’s high-speed antics and stunning landscapes, and foreshadow its many quick turns, smash-ups, near-misses, and victories. Paired with Jimmy Durante’s jovial voice and a theme full of honks, hoots, and banjo, the sequence launches viewers into an epic car rally and a cast of oddball characters who will stop at nothing to win. It’s Monte Carlo or bust! Our thanks to Matt Jones for his assistance with some materials featured in this article.